Class IX myosins are found in animals from invertebrates to vertebrates. Invertebrates contain a single myosin IX gene, whereas vertebrates contain two myosin IX genes, MYO9A and MYO9B. 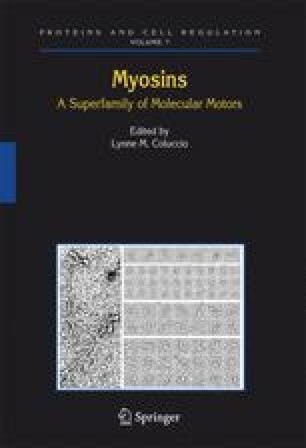 Mammalian Myo9b, the only class IX myosin studied so far, has unique motor properties. It is the first myosin for which ATP hydrolysis is the rate-limiting step in the chemical cycle and although it is a single-headed myosin, it can take multiple steps along F-actin before dissociating. Class IX myosins are motorized signaling molecules that contain in their tail domain a Rho GTPase-activating protein (GAP) activity. Mammalian members of myosin class IX negatively regulate the monomeric GTP-binding proteins RhoA-C. In cells, Myo9b accumulates in regions of active actin polymerization such as in extending lamellipodia. In these regions Myo9b might locally down regulate contractility and adhesion that are controlled by Rho activity and thereby contribute to sustained lamellipodial extension and cell polarity.